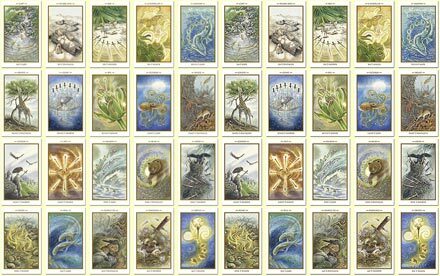 The beautiful artwork displayed in the gallery below is prints of the different cards within The Animals Divine Tarot. Please ask permission to use the images you see below before using them for custom cards with your Vistaprint coupon or as part of any other deal from a commercial print shop. All artwork, photographs & copy; © 2005 Lisa Hunt, all rights reserved. No part of this site may be reproduced, stored in a retrieval system, linked to, or transmitted in any form or by any means -- electronic, mechanical, photocopying, recording or otherwise -- without the written permission of the copyright owner. Site design by Lisa Hunt and Kort Kramer; www.KramerKreations.com, © 2005, all rights reserved.